Tefal are the world leader in non-stick cookware and have continued to create innovative solutions across all kitchen appliances, from cooking appliances to food storage and kitchenware. The Tefal kettle is no different, mixing high-quality design, functionality and ease of use. 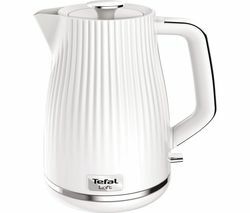 Tefal kettles combine modern and traditional design, making them suitable for any kitchen style or décor. You can make up to seven drinks at a time with a 1.7L capacity and place your kettle back down on a 360-degree rotational base, keeping your kettle firmly in place. Tefal kettles come with an anti-lime scale filter to keep your kettle and water clean and in good condition over a long period of time. Using the smart water level markings on the kettles, you can boil just as much as you need, which in turn will save energy. 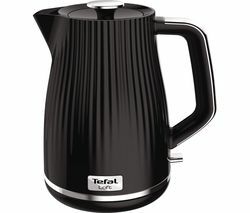 Like a traditional kettle, they come with a removable lid and a precision spout for easy everyday use. The most striking part of a Tefal kettle range are its distinctive designs. Combining stainless steel with beautiful neutral colours, your Tefal kettle will fit seamlessly into any kitchen style to assist you when making your perfect cup of tea or coffee. The Tefal Maison range have a 3 kW element which means you can boil your water faster and they’re less susceptible to lime scale damage. With dual water windows and a light indicator so you know when your kettle is in action, these kettles will make the everyday task of boiling water an easy one. Looking to update other kitchen appliances? View our toasters to make a set or even mix and match. If you're a coffee lover why not view all espresso machines?